While Baltimore City is known for its storied rowhomes with their marble steps and painted screens, the Towson neighborhood of Rodger’s Forge in Baltimore County offers a different type of living. With sizable lots and a historical designation, these are not your ordinary rowhomes (technically, they are called Townhomes in the County and not EVERY home in Rodger’s Forge is townhome, but mostly). Rodger’s Forge is a charming community of roughly 1700 thoughtfully designed townhome and single family homes in a lovely, tree-lined neighborhood just outside the northern Baltimore City. Rodger’s Forge has a lot to offer its residents, including being a walkable community that is close to schools, restaurants and businesses in downtown Towson. 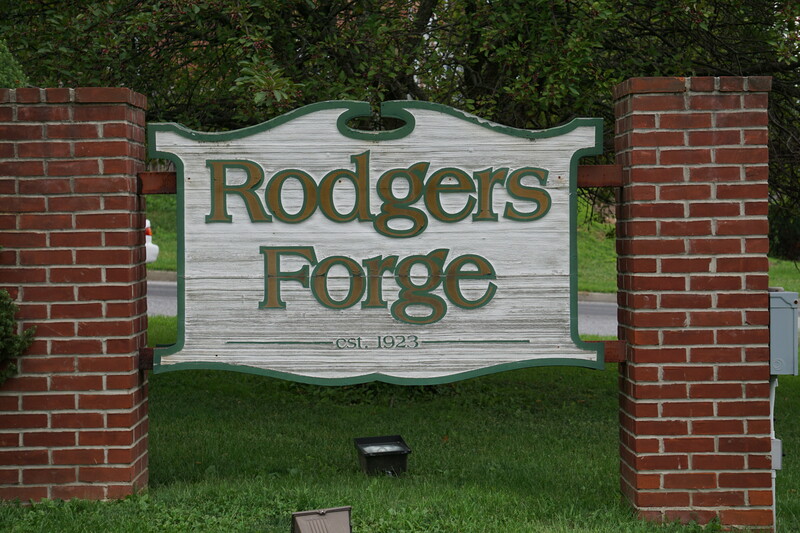 Rodger’s Forge is known as a super family friendly community with a renowned “Tot Lot” that is a draw for kids and parents from all over Baltimore County. Halloween in this neighborhood is a crazy, sugared up kids’ fest, and if you stick around long enough, you might run into Olympic gold medalist Michael Phelps (it’s where he grew up) – or, even more exciting, me (Rodger’s Forge is home for me, Katy and the kids). Ready to check out all that homes for sale in Rodger’s Forge has to offer? If so, give me a call at 443-564-0952 or send me an email. I will be happy to create a free, no obligation automated home search for you that will deliver homes meeting your criteria directly to your email. Once you have identified the homes for sale in Roger’s Forge that you want to see we can schedule a visit. One of a kind, end of group town-home in Rogers Forge which overlooks the park and is actually a court, so no thru traffic. Hardwoods on Main and Top Floor. Dricore subflooring system installed in basement makes it feel like a wood floor not concrete. This 3 bed, 1.5 bath home enjoy a front porch and a back deck. See the pictures (posted soon) to understand why this is a true find,nothing else like this in the area. Home has been freshly painted and professionally cleaned, enjoy the pine wood floors. Stairs are carpeted though wood floors exist below. A Chairlift can be sold or removed with the property, currently installed on the main/2nd floor stairs. Home is set in the historic neighborhood of Rogers Forge and has a voluntary (contribution) to the HOA ranging from $30 - $90 per year, covenants en force regardless. Parking in court (on street) or in the back via the alley that borders the park. Recently renovated bathroom and kitchen (2016). Natural Gas Stove, HVAC and Hot Water. Mostly finished basement. If you are searching for a home in Rogers Forge where you can sit and relax on your back deck and enjoy the tree's of the park, walk you dog or play with you kids, or to simply entertain friends and family, this is the home for you! Photoshoot set for Wednesday, interior pictures coming soon!! The owners have thoughtfully and lovingly renovated this immaculate Rodger's Forge home. There are many things to brag about. First, LOCATION, LOCATION, LOCATION. This home is highly walkable to all that the Rogers Forge area has to offer; shops, restaurants, coffee, bowling, ICE CREAM, and more! This is certainly a desired location in the neighborhood. Recent updates and features; NEW gorgeous kitchen renovation includes quartz counters, stainless steel appliances and LOTS of cabinets, huge island great for entertaining, double wall oven and cooktop, open-concept room with large space for the dining room table, NEW beautifully refinished hardwood floors throughout, newly painted throughout, fully finished basement with NEW additional full bath, large recreation space with gas fireplace, separate laundry area and walk-out stairs, fully fenced backyard with patio and small space for gardens, detached garage with parking for 1 small car as well as pad parking in rear of home. This is not just a standard, updated home. As soon as you walk in you will see why it stands out above others in the area. Step through the front door into this beautiful light-filled home. From the beautiful hardwood floors that run throughout most of the main level to the period architectural details this home is a gem. Kitchen offers granite counters, breakfast bar with clean white backsplash tiles. Head upstairs to the 4 bedrooms, all with hardwood floors. Don't miss the bathroom that harkens back to the 30's with the black & white tiling & don't forget to look up at the delightful skylight. The basement is finished and offers a powder room. The large fully fenced backyard is a great place to relax and offers you access to your 1-car garage. BEAUTIFULLY remodeled Rodgers Forge townhouse with 4 bedrooms and 2 full baths. This house has it all from a brand new gourmet kitchen complete with granite counters, large kitchen island, brand new stainless steel appliances, built-in microwave, gas range, dishwasher, plus armoire refrigerator! Solid wood cabinets & drawers that have the slow close! A totally brand new full bath was added to the lower level, as well as a 4th bedroom! The full bathroom on the top level has also been totally renovated too! Other features include: HVAC 2019, new water line to the street Nov. 2018, refinished hardwood floors throughout the top two levels, deck off of the kitchen, brand new carpeting in the lower level, recessed lights, open layout on the main level, fully floored attic with pull down stairs for extra storage, walk-out basement! Check out the virtual tour! BUYERS FINANCING FELL THROUGH - BACK ON MARKET! INSPECTIONS ARE ALREADY COMPLETED AS THIS HOME IS WAITING FOR YOU!! * Absolutely STUNNING 3 Bedroom 2 Full Bath BRICK end of group townhome in RODGERS FORGE * BEAUTIFUL kitchen upgraded in 2015 with GRANITE counter tops, BACKSPLASH, stainless steel appliances and BREAKFAST bar * GLEAMING hardwood floors on the 1st and 2nd floors * CHAIR rail * SPACIOUS family room on lower level with UPDATED full bath * WALKOUT stairs from LOWER level * LARGE fenced yard with brick patio, fire pit and shed * PARKING pad in rear * 40 year shingle roof just 7 years old * A MUST SEE!! Relaxed Luxury! This End-of-group has been renovated with an open, bright floor plan for today~s busy lifestyle. The best of the charming old patina has been preserved and polished, while sleek new amenities were carefully blended. Goodies Include: 10 foot Quartz waterfall island, Stainless steel appliances, recessed LED can lights, refinished hardwood floors, and a new glass kitchen door to the back porch. It adds to the sunny feel, and opens to a grill deck covered by a very cool 'glass' awning! And it's more than just good looks: notice the updated electric and new Pella windows... Fresh paint, refinished hardwood floors, charming covered front porch , reovated 1st floor half bath and updated main bath. Because it's a 'bigger than others' EOG, you get a BIG master bedroom with BIG master closet, not to mention a BIG fenced yard. There's still plenty of space for the rear patio, Parking Pad and 8~x8~ Shed!